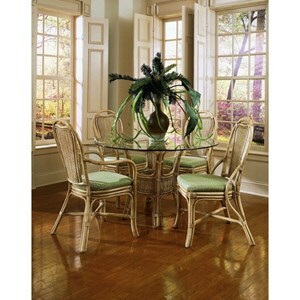 This wicker and rattan dining chair is all about creating a causal coastal style. It features cured legs and a rounded seat back with weaved and tied elements. The seat cushion enhances the coastal look while also provided relaxed comfort. Pair this chair with it's coordinating dinging table. This chair is available in an armchair and armless chair option. 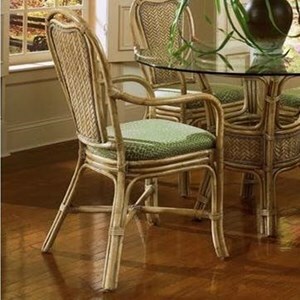 The Acapulco Wicker Rattan Dining Side Chair by Braxton Culler at Hudson's Furniture in the Tampa, St Petersburg, Orlando, Ormond Beach & Sarasota Florida area. Product availability may vary. Contact us for the most current availability on this product. This dining room collection will offer you a casual style that reminisces of coastal homes in both relaxed and tropical environments. 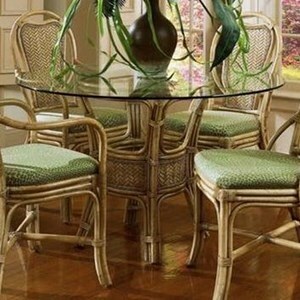 The group is made of wicker and rattan with seat cushions on the chairs and a glass top on the table. The Acapulco collection is a great option if you are looking for Tropical Coastal furniture in the Tampa, St Petersburg, Orlando, Ormond Beach & Sarasota Florida area. Browse other items in the Acapulco collection from Hudson's Furniture in the Tampa, St Petersburg, Orlando, Ormond Beach & Sarasota Florida area.